• Collect 15 eggs in total by April 30th to earn a surprise free offer – don’t forget to keep count! *T&Cs apply. The Red Rooster Easter Egg Hunt is only available in Delivery from 15/04/19 to 30/04/19 close of business. Only one voucher code offer is valid per transaction. Only offers with Red Rooster Easter Eggs are valid for the promotion. Each Easter Egg is worth one Easter Egg with the exception of the Hellfire Egg which is worth 10 Easter Eggs and is only available in selected offers. 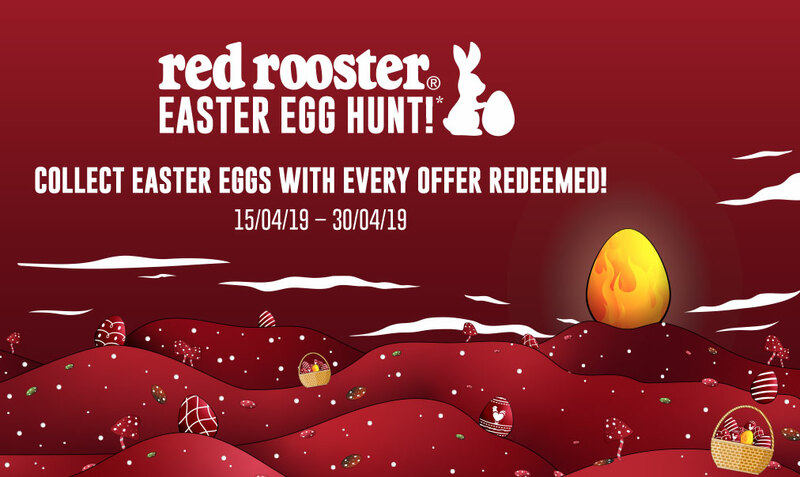 Eligible winners must collect 15 Red Rooster Easter Eggs in total by redeeming as many valid Delivery offers as necessary by close of business 30/04/19. Each offer is worth a different number of Easter Eggs. Each participant must keep count of their own Easter Eggs redeemed. All eligible winners will receive a surprise free offer by 03/05/19. 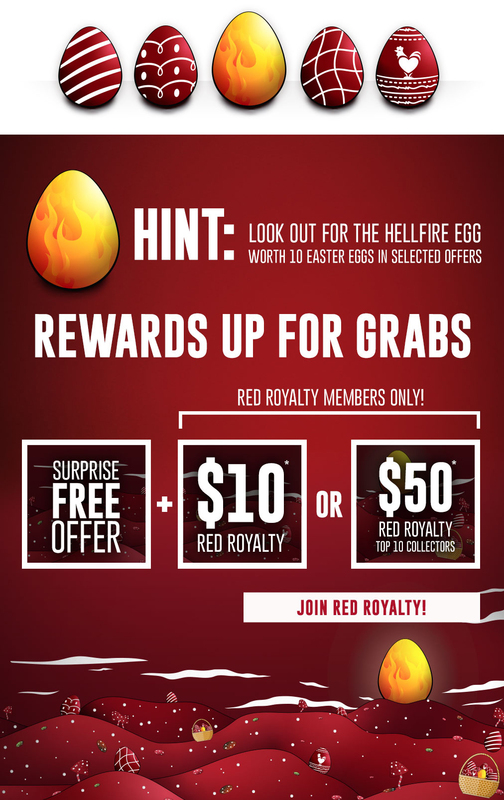 Red Royalty members who collect 15 Easter Eggs or more are also eligible to receive 10 Red Royalty dollars by 03/05/19. The top 10 Red Royalty member collectors that collect the most amount of Easter Eggs by 30/04/19, will receive 50 Red Royalty dollars, instead of the 10 Red Royalty dollars. Participants may join the Red Royalty program and become a member before 30/04/19 to be eligible for the Red Royalty rewards.